Northerners still get excluded from political decisions that impact their lands and livelihoods, Premier Bob McLeod told a group meeting in Iceland this week. Despite improved relations between the federal government and Canada's Indigenous people, northerners still get excluded from political decisions that impact their lands and livelihoods, says Bob McLeod, premier of Canada's Northwest Territories. "Colonialism is not entirely absent," McLeod told a standing-room only crowd of international diplomats, business leaders, media and academics at the Arctic Circle Assembly, an annual event held in Iceland to foster international dialogue about the North. "We saw [this] last December when Canada declared a unilateral moratorium on oil and gas development in the Arctic without prior consultation with either the public government of the Northwest Territories or the Indigenous people of the region," he said on Friday. Last winter, Canadian Prime Minister Justin Trudeau said the risk of Arctic drilling justified the moratorium, but that the decision would be reviewed after five years. Northern leaders pushed back, saying the decision would put the brakes on much-needed economic development. In Iceland on Friday, McLeod said closer cooperation between Canada's territories and other Arctic regions was needed to better protect the interests of northerners, pointing to the pan-territorial vision for sustainable development, released by the Northwest Territories, Yukon and Nunavut, last month. In it, the territorial governments call for an end to unilateral decision making on areas affecting their regions and stress the importance of Indigenous participation in economic and resource development. McLeod said the territories recognize that the resource economy can't be the only focus of development, and called for greater investments in infrastructure, clean energy and innovation that could lead to a northern knowledge economy. "Our vision is built on the recognition that the people of the Northwest Territories, Nunavut and Yukon are our number one priority and our most important resource," McLeod said. "The people of the Arctic want what everybody else wants. They want good jobs and a good standard of living. They want to be healthy and educated. And most of all, they want a sustainable future for themselves and their families, based on their own vision and priorities." 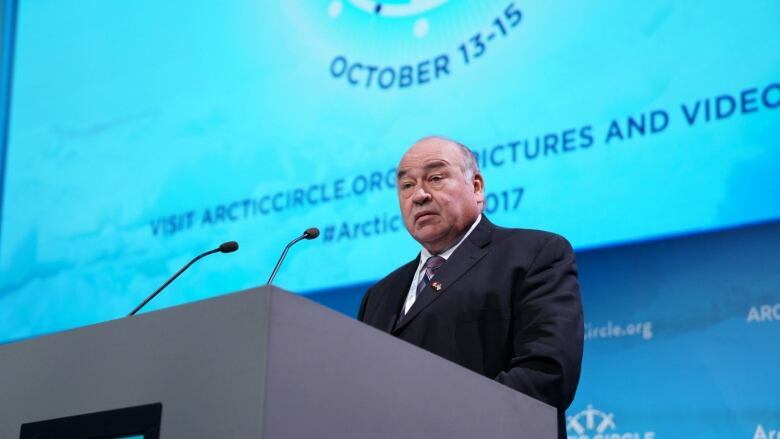 McLeod's remarks were made during the Arctic Circle Assembly's opening session alongside Iceland's Prime Minister Bjarni Benediktsson, Iceland's President Guðni Thorlacius Jóhannesson and Ségolène Royal, France's ambassador for the Arctic and Antarctic Poles. The implementation of the Paris climate agreement dominated many of the speeches. "The worst is yet to come," Benediktsson said of climate change. "The melting may impact the entire climate system of the earth." The Paris agreement was heralded as a major political achievement when it was reached in 2015. But the international community was left reeling when U.S. President Donald Trump said in June that he would pull out of the accord, saying it would be bad for the U.S. economy. "The consequences of climate change are already being felt all over the planet," said Royal, who was president of the UN climate change process at the time of the Paris agreement and one of the accord's key architects. "We all know we still need to work very hard on implementing the Paris agreement," she said. "The climate fight is a major step towards global justice and human dignity. And if we are united in this fight, we will win." The Arctic Circle Assembly runs until October 15.